Academy Award–nominated director/writer Peter Hedges (“Dan in Real Life,” What’s Eating Gilbert Grape?”) brings enchantment to the screen with “The Odd Life of Timothy Green,” an inspiring, magical story about a happily married couple, Cindy and Jim Green (Jennifer Garner and Joel Edgerton), who can’t wait to start a family but can only dream about what their child would be like. When young Timothy (CJ Adams) shows up on their doorstep one stormy night, Cindy and Jim—and their small town of Stanleyville—learn that sometimes the unexpected can bring some of life’s greatest gifts. Download The Odd Life of Timothy Green in Digital HD from the iTunes store. 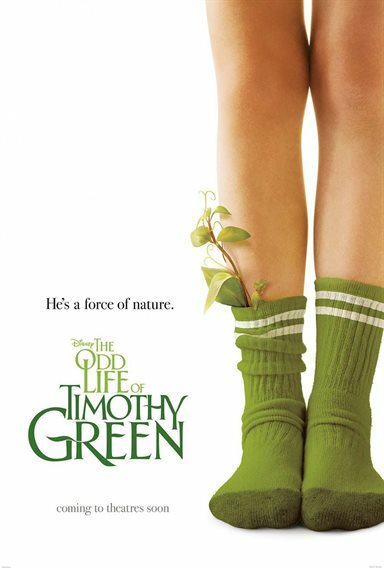 The Odd Life of Timothy Green images are © Walt Disney Pictures. All Rights Reserved. An enchanting story of inspiration and hope, The Odd Life of Timothy Green opens in movie theaters. The nice little film has an uplifting story for the whole family even though it over fanaticizes at times. Translation from script to screen seems to have been a chore however and the pieces of the puzzle look like they have been jammed together rather than a perfect fit. 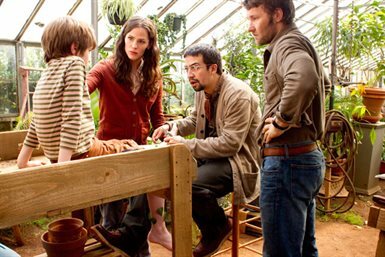 The story centers on a married couple Cindy (Jennifer Garner) and Jim Green (Joel Edgerton) who are living the American dream except for the lack of children they wish they could birth together. Even adoption has eluded them to the point that they have given up the idea of ever making their family complete. One stormy night the couple decides to fanaticize on what their child would be like if they could have one for their very own. Writing their dream child's characteristics down on pieces of paper, the two find themselves conjuring up the perfect child. Following a brief moment of reality, the two decide to bury their dream in a flower garden in their yard. Upon returning to the house they spot something strange, a child covered with mud and spouting leaves on his legs. Astonished and confused the couple names the boy Timothy and decides to keep the child for their own. The film goes on from there showing how Timothy (CJ Adams) starts relating to the community, develops a close bond with Joni (Odeya Rush) a classmate and brings a lot of sunshine to the villager's lives. The idea coming from the interesting script plays out very realistically, but it does come with a downside. The acting by the central cast gets very superficial instead of compatible with their characters, the story wanders somewhat and the relationships of the town folks acted out on the screen look strained. Although this detracts, the film does not loose it's meaning and inspirational value. Taking place in small town America, one would think there are very few secrets that the towns folks would not be privy. Out of nowhere, however, appears a ten-year-old magical boy that's not explained very credible yet blends into their society and gets accepted. A very hard concept to accept director Peter Hedges fails to make it truly believable on the screen. Although he does a fairly good job of hooking his audience with the two child leads, I felt Garner and Edgerton were wrong choices for Timothy's parents. Their performances look cold where there should have been more feeling and their desperation to give up their chances for a child in their marriage doesn't come off the screen as plausible as it should. The performances by Odeya Rush as Joni Jerome and CJ Adams as Timothy are outstanding. Much like the characters Tom and Vada in My Girl, Rush and Adams make that kind of chemical magic on the screen. The relationship between the youths begins from a life-changing stimulus, slowly builds and forms an unbreakable bond. It's opposites attract, outsiders become leaders and odd friendships can provide inspiration for young kids who find themselves in a tenuous situation. The Odd Life of Timothy Green has been rated PG by the MPAA. It's a true family film that inspires and teaches important values. The Odd Life of Timothy Green images © Walt Disney Pictures. All Rights Reserved.